February 14th. When you are dating, or married with no kids, you might go on a date or cook up a fancy dinner at home. Once you have children, even if you do go on a date, will have to plan to celebrate a family Valentine’s Day as well! This post uses affiliate links. See our disclosure page for more information. I like to find simple ways to make memories with my children and Valentine’s is a perfect opportunity to do that. Sometimes, life can be crazy and money can be tight. We don’t have to be elaborate. Even small things can get them excited and make a special family Valentine’s Day. Think of your family’s favorites and see if you can turn it into a heart. The pizza is our go-to every Valentine’s Day. The kids talk about the heart pizza all year. I want to try this artificial color free food coloring! Also, consider setting a fancy table and lighting candles to make the meal more special. We loved this growing up and it is now my kids’ favorite! Instead of just giving them their Valentine’s gift/candy, make them a treasure hunt. For pre-readers, draw picture clues that lead to the prize. For young readers have simple riddles and as the kids get older you can use more difficult ones. We try and have 6-10 clues for each child. I will try and update this post with the clues we use for my three kids this year. In the meantime, here are some ideas you can use! You don’t have to go crazy, unless you want to, but put up at least a few heart and love themed decorations. You can make them yourself or use something you buy even as easy as window clings or a banner you bought. Check Wal-Mart, Hobby Lobby, and even the Dollar Store for options. The same with crafts. Either purchase a kit or come up with your own. This post has 25 cute ideas! This is a perfect afternoon project. Tip: Keep your eyes on the Valentine’s clearance to pick up some craft and decoration items for next year. Use this day to purposefully share with the members of your family how special they are. Have each person write a note to each family member and have them at each person’s place at the dinner table. Throughout the day, secretly do special things and kind deeds. You could either do them for everyone or draw names the night before. The name drawn is the person you try to secretively do kind things for. Give your kids ideas – it might be doing chores, picking up something their secret partner forgot, leaving a piece of candy, nice words, asking them if they need anything etc. Just spend time together. Put away the phones and focus on each other. Engage with them, be excited to spend time with your kids. Plan something your family will enjoy and have a blast. 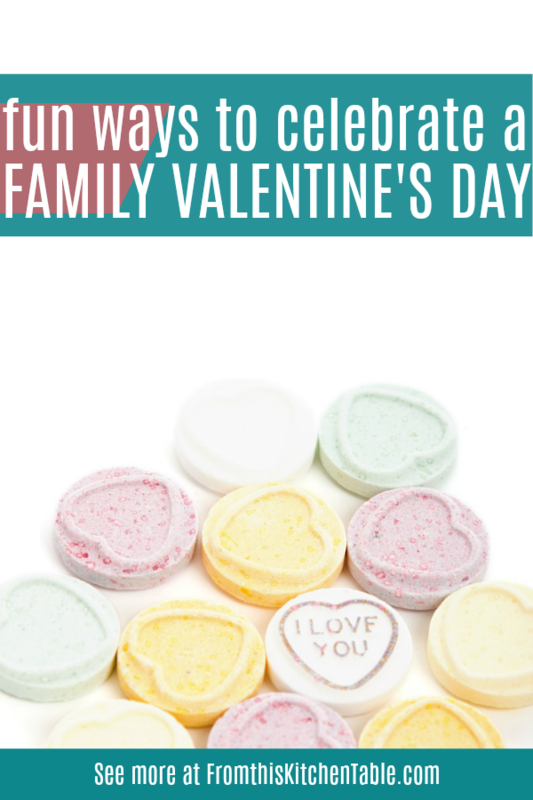 Just intentionally putting a little thought into your family Valentine’s Day can help create memories and traditions that your kids will remember years to come. They might even carry on one to their own families. You don’t have to be fancy, elaborate, or expensive. Just do something and have fun! What are your favorite Valentine’s Day traditions with your kids? 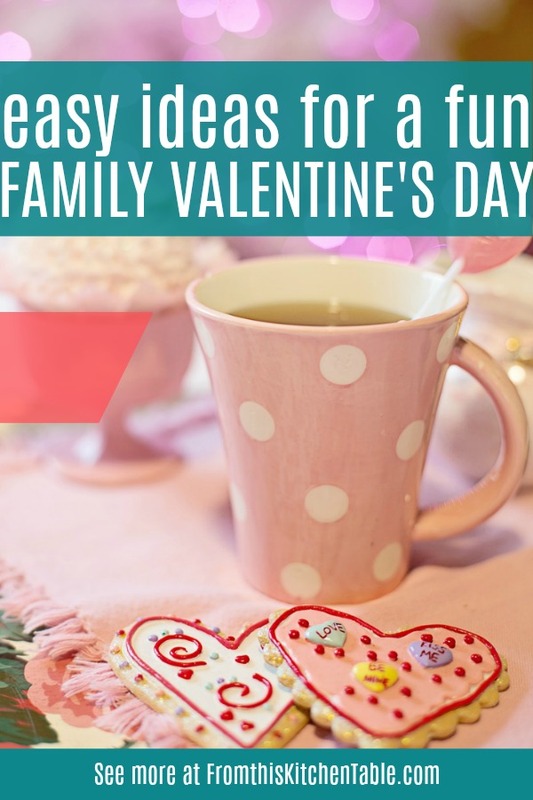 This entry was posted in Family, Valentine's Day on January 18, 2019 by Deanna Michaels.